The No. 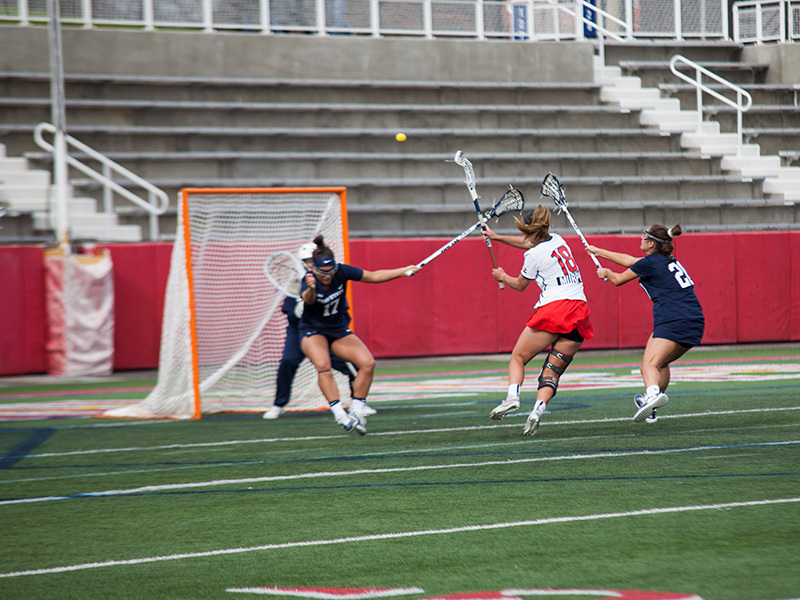 1-seeded Stony Brook women’s lacrosse team started its run to the America East Championship in dominating fashion Friday, May 4, dismantling No. 4-seeded New Hampshire 19-5 at Kenneth P. LaValle Stadium. The Seawolves scored 16 goals in the first 30 minutes, tied for the most goals in a half this season for the team with March 24’s game at UMass Lowell. Redshirt-senior attacker Courtney Murphy, senior attacker Kylie Ohlmiller and sophomore attacker Taryn Ohlmiller, collectively known as the #LI3, combined for 12 goals and 10 assists. Spallina references the playoffs as the new season, and achieving success in them has been the goal for the Seawolves all along. The team came out motivated and ready to play, scoring the first 13 goals of the game in the opening 21 minutes. Nine of the 13 goals came from the sticks of the #LI3, with the other four from senior midfielder Tiffany Zullo, sophomore midfielder Ally Kennedy and freshman midfielder Siobhan Rafferty. Zullo had two goals, while Kennedy and Rafferty each scored one. New Hampshire did not score until the final five minutes of the first half, and trailed 13-1 at halftime. The team outscored Stony Brook 4-3 in the second half but, at that point, Stony Brook just sat on the ball and used the running clock to its advantage. Kylie Ohlmiller led all players with nine points, scoring four times and dishing out five assists. She now has 137 points on the season, the most in the NCAA this year. Murphy scored a team-high five times and had two assists, good for seven points. Taryn Ohlmiller netted three goals and recorded three assists for six points. Together, the three registered a combined 22 points in the win. The second semifinal game was between No. 2 Albany and No. 3 Binghamton, in which Albany prevailed 16-10. The Great Danes’ victory pits them against the Seawolves in the America East Championship. This will be the seventh straight meeting in the America East Championship between the two teams. The last time Stony Brook didn’t make the America East playoffs was the 2011 season — Spallina’s first as head coach — with the team posting a 4-11 record. They made the championship game in 2012, but fell to Albany 9-7. Since that loss, the Seawolves have notched five straight wins against the Great Danes in the conference championship game and have a chance to make it six on Sunday evening. “Now we have an opportunity to secure our second goal on Sunday, which is to win the conference and get the automatic qualifier in the NCAA Tournament,” Spallina said. Stony Brook and Albany face off for the conference trophy Sunday, May 6 at 12 p.m. at Kenneth P. LaValle Stadium.